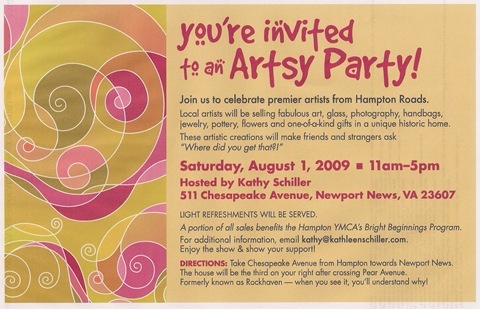 My friend Kathy has organized an "Artsy Party" to help benefit our local YMCA. She has opened her lovely home on the James River in Newport News and invited 25 local artists to offer their creations with a percentage of sales going to the YMCA Bright Beginnings program. I am sending a few things over for the sale, but I personally won't be able to attend because we are heading out for a family vacation tomorrow to Montreal! So if you happen to be near Newport News, VA on Saturday, please come by. These items are going to the sale. So, after a little sewing for the Artsy Party I finished one other craft project. 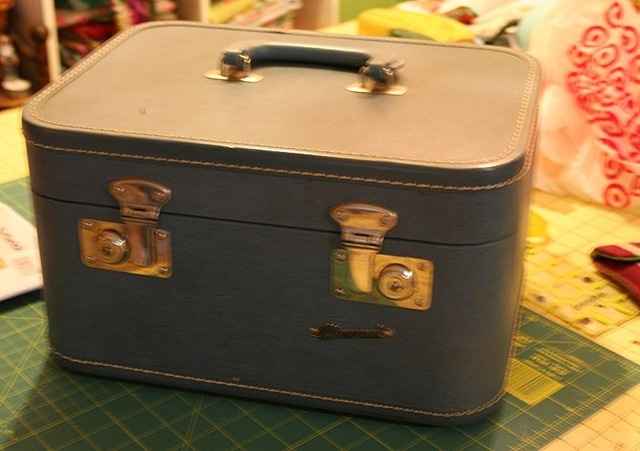 My BFF Beth gave me a really nice vintage train case. I got out the mod podge and turned it into a crazy quilt of vintage wallpaper. It was a little tricky with all the hardware. 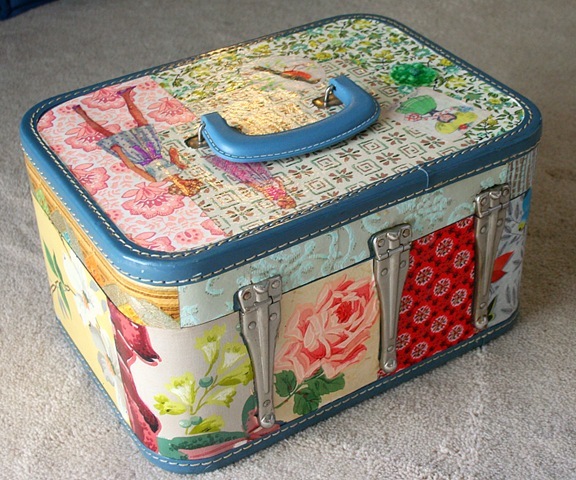 It will make a great case to contain my jewelry making supplies. Check out the Mod Podge Rocks blog. Love the makeover of the case. 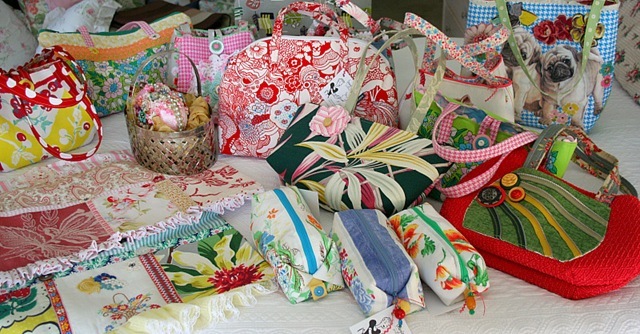 Love the quilty case, Suzy! You will have a wonderfully Successful show! I loved your blog and your blog header is lovely! Have a wonderful vacation. The case is fabulous as is everything you create. I love the seashells on your blog banner. 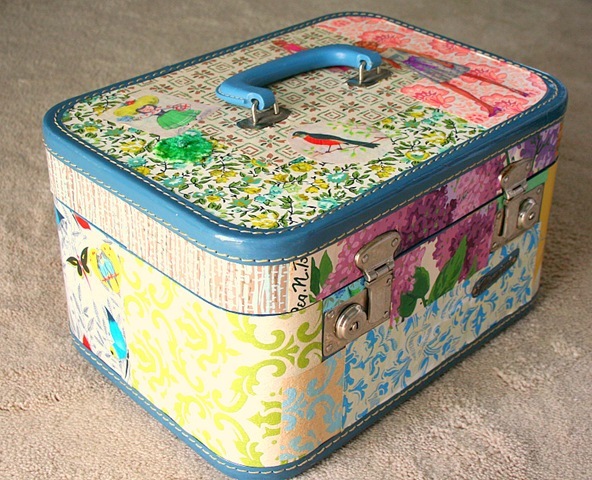 Found your fabulous train case via MPR. Jaw-dropping GORGEOUS!! Thank you for sharing, now…back to checking out the rest of your blog!